This cable can be used for connecting your pc or laptop to a display with a component or RGB input such as TV, HDTV etc. 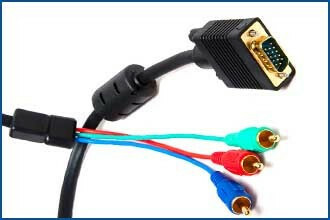 The cable will work only if your display card supports output to TV via the VGA port, please check your display card specification before purchasing. 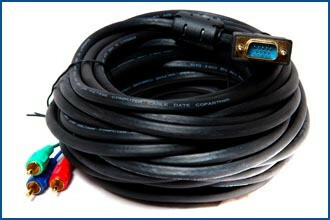 This cable can also be used for connecting a Component source (DVD, Set Top box etc) to a Projector with switchable VGA/ Component input. 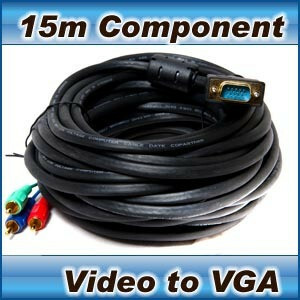 This Component Video/RGB to VGA cable is guaranteed to offer the best picture and sound quality for your equipment. If you are not 100% satisfied with the quality and performance of this item simply send it back to us for a full refund. This cable is also available in other lengths. Just click Component Video on the navigation panel to the left.